NEW DELHI: India will retaliate massively even if Pakistan uses tactical nuclear weapons against it. With Pakistan developing "tactical" nuclear warheads, that is, miniaturizing its weapons to be carried on short-range missiles, India will protect its security interests by retaliating to a "smaller" tactical attack in exactly the same manner, as it would respond to a "big" strategic attack, said a report published in The Times of India. Articulating Indian nuclear policy in this regard for the first time, Shyam Saran, convener of the National Security Advisory Board, said, "India will not be the first to use nuclear weapons, but if it is attacked with such weapons, it would engage in nuclear retaliation which will be massive and designed to inflict unacceptable damage on its adversary. The label on a nuclear weapon used for attacking India, strategic or tactical, is irrelevant from the Indian perspective." This is significant, because Saran was placing on record India's official nuclear posture with the full concurrence of the highest levels of nuclear policymakers in New Delhi. Giving a speech on India's nuclear deterrent recently, Saran placed India's nuclear posture in perspective in the context of recent developments, notably the "jihadist edge" that Pakistan's nuclear weapons capability have acquired. Saran argued that as a result of its tactical weapons, Pakistan believes it has brought down the threshold of nuclear use. "Pakistani motivation is to dissuade India from contemplating conventional punitive retaliation to sub-conventional but highly destructive and disruptive cross-border terrorist strikes such as the horrific 26/11 attack on Mumbai. What Pakistan is signalling to India and to the world is that India should not contemplate retaliation even if there is another Mumbai because Pakistan has lowered the threshold of nuclear use to the theatre level. This is nothing short of nuclear blackmail, no different from the irresponsible behaviour one witnesses in North Korea," he said. One of the main reasons for Pakistan miniaturizing its nukes is actually to keep its weapons from being confiscated or neutralized by the US, a fear that has grown in the Pakistani establishment in the wake of the operation against Osama bin Laden. "Pakistan has, nevertheless, projected its nuclear deterrent as solely targeted at India and its strategic doctrine mimics the binary nuclear equation between the US and the Soviet Union which prevailed during the Cold War," Saran said. However, warning Pakistan, he added, "A limited nuclear war is a contradiction in terms. Any nuclear exchange, once initiated, would swiftly and inexorably escalate to the strategic level. Pakistan would be prudent not to assume otherwise as it sometimes appears to do, most recently by developing and perhaps deploying theatre nuclear weapons." There have been significant shifts in Pakistan's nuclear posture recently. First is the movement from uranium to a newer generation of plutonium weapons, which has enabled Pakistan to increase the number of weapons, outstripping India in weapons and fissile material production, although they are still to be verified. Pakistan has claimed it has miniaturized nuclear weapons to be used on cruise missiles and other short-range missiles. The newer generation of Pakistan's weapons is also solid-fuelled rather than liquid, making them easier to transport and launch. Are they just having wet dhoties because they have yet to comeup with their own tactical nuclears warheafs and delivery systems. Another bull sh1t article. Do they not think that Pakistani military commanders will have considered that. This is just posturing. If a battlefield nuke was to initiate attack of Pakistani cities do u think ndia will be safe. That's why it's called MAD. A strategic strike would be met with a similar response. As stated by Butterly, it's all written out in the MAD doctrine. Tactical nuclear weapons are a massive problem for India, the use of one would prompt them either to commit scuicide by launching a full scale nuclear strike triggering a similar response, or to accept it and carry on fighting. Neither option is acceptable. Pakistan has a second strike capability, but it needs to develop a truer capability, which will come from nuclear armed submarines. No doubt it is a MAD scenario and I am just trying to Imagine how Indian would diplomatically justify strike against civilian population when attack against itself were limited to military targets and that too within theater of war. Assume Pakistan uses Nasr with tactical nukes to knock out major tank advance say in Rajistan sector, than how would Indian justify attack on civil population in say Lahore. tactically speaking India at present has been caught with its pants down with regards to how fast and diversified Pakistan is developing tactical weapons. While India is yet to produce tactical weapon of similar nature, thought they might be doing it in the future but their lack of attempts perhaps shows difficulties they might be facing. The problem they are facing is tactical weapons such as Nasr but also combined with cluster bombs they are facing massive problem and their frustrations are showing in that publication. 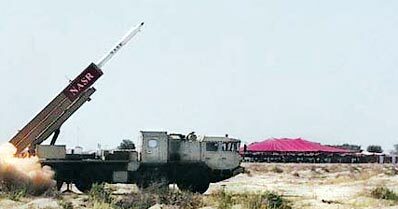 India is yet to produce tactical weapon but also it has not produced cluster weapons. However, if Pakistan is able to convert current clusters to sensor fused cluster bombs than it is a major major problem for India, which they have now started to realize. Further to example I cited in previous post how tactical nukes can be used to wipe out mass armor advance, but at the same time sensor cluster delivered either through Nasr or from jet fighter will not only pose problem for their armor but also advance troops thus severally restricting their strike element when keeping cold start doctrine in mind. The only terrorist attacks in india are being sponsored by the indian intelligence agency! india and its retarded raw agency can go screw itself. You wanna invite your annihilation by making such childish remarks, then go ahead. If we are going to be nuked, then we will make that india is nuked outta existence. We have nothing to lose and everything to gain from this! tactical weapons is one the main pain in back for terrorist & hindurapeistan india, and this is why they are in process of acquiring iron dome and even considering to get air defense shield from uncle sam... but i dont think Pakistan will ever use tactical weapons, terrorist & hindurapeistan india will fall on it own from within they have huge issues more then 6 states are fighting for independence , hunger is on rise which is a bigger bomb. ^^ I think you're missing the point here. The enemy (gutter-rat india) put forth a Cold Start doctrine which would allow it to perform surgical strikes against Pakistan in retaliation to terrorist attacks on their soil. The culprit for these terrorist attacks would be made to be Pakistan. As they would need a valid reason to perform surgical strikes against Pakistan. A state sponsored terrorist attack would be orchestrated by rat-india itself, since Pakistan is neither that stupid nor that ignorant to do order such a useless mission. The 'Cold Start' doctrine allows rat-india to perform surgical strikes initially, while the military slowly mobilizes. In military operational planning, this allows freedom of executing missions without having the whole military involved. And this is a lesson that the rodent-indians have actually learnt and borrowed from Pakistan Military. In specific, from Pakistan Army's military operation in Kargil, 1999. Where specific planning was executed to deploy Mujahideen units in the Kargil sector, without havin to have Pakistan Air Force or Pakstan Navy or Pakistan Army fully involved. By introducing tactical nukes into Pakistan Military's doctrine, the rat-indian Cold Start doctrine is effectively neutralized. Where rat-indian army would not be able to exercise platoon level or battalion level offensives into Pakistan's territory. And, would have fear of retaliatory strikes launched by Pakistan Military where tactical nukes would annihilate border-proximity enemy unit deployment. Such an loss would not only bog-down the rat-indian army's mobilization, which would be a follow-up to the initial surgical strikes by the rat-indian Air Force. But would also result in a rollback of any plans by the rat-indian military's Cold Start mobilization. I wish we had someone who could say on the tele with utmost conviction to India; We die, we get paradise, you die, you burn in hell for ever. Possibly from a bearded Muslim with crazed eyes - staring right into the camera. (Also someone in position of authority). That should probably get them freaked. Diplomatically this is a victory for Pakistan. Tonight both nations should sleep in peace. MAD is official now. As New Delhi gave signals of 'I am waiting to be impressed' to a financially broke Pakistan with new acquisitions and IRBMs targeted at China. As tea houses in Mumbai echoed of repeat of US May 2 raid in Pakistan involving Flankers and C-130Js. It seems all it took to get New Delhi`s attention was just a little missile in a container and the Chinese to march 10 kms into unwelcome territory. Alas, we are only human in the end. Edited by Magnus, 30 April 2013 - 07:15 PM. Pakistan should shoot a missile across bow and detonate it in the bay of bengal, just to give em a shutup call. Maybe once zardari (y' know, the one who has a hindu living inside his rectal cavity) is out of office. tacticle nuclear will be a failure. It doesnt wipe out armor. Pakistan should pay more attention cluster guided anti armor. it is more efficient, more devastative, and cheaper. Few of them will block the attack. - Secondly as a soverign nation we have every right to attack an invading agressor within our borders with whatever weapons are available at our disposal. - Thirdly, if you do and we fire a tactical nuke, do you not think we would have beforehand alerted our strategic forces to be on a hairline trigger to fire everything at the first sign of an indian strategic response to our tactical response. At the first sign of you firing your missiles, ours would be on their way already. We would not wait to see what survives. Then it would be a case of 500million indians wiped out and 120million of our own (as mentioned in the new book on Clinton - he thought Indians were crazy thinking they could win a nuclear war), because of indians and their stupidity at thinking they could win in a MAD scenario. The most indians can or could do is surgical strikes at 'supposed' training camps in the event of any terrorist action in India which it blames on Pak or Pak sponsored organisations. More than that and it is inviting MAD. In any event, the indian meddling and sponsoring of extremist and separatist organisations in Pakistan is and will have a blowback effect on India itself ultimately, and they need to learn from Pakistans mistake of allowing the various tehreeks, and jaishe's etc to exist (or tolerating them), that the snake you rear will one day rise up and bite you. Secondly as a soverign nation we have every right to attack an invading agressor within our borders with whatever weapons are available at our disposal. this has been answered by India - tactical nukes are for use in Pakistan or in proximity to which India will respond with a full scale nuclear attack. - Thirdly, if you do and we fire a tactical nuke, do you not think we would have beforehand alerted our strategic forces to be on a hairline trigger to fire everything at the first sign of an indian strategic response to our tactical response. The distance between India and Pakistan. With India`s second strike capability in mind, what is the plan for initial attack + what is the contingency plan if something goes wrong. With 100s of nukes exploding in the subcontinent -> how aware are Russia and China of consequences for their bordering regions? In case of a naval blockade, will Pakistan nuke the Indian warships in Pakistani waters? tactical war or the cold doctrine. ^^^What good is MAD when the enemy doesn't think you are mad enough for MAD? If the Indian stated response to a tactical nuclear strike is mass nuclear attack, then Pakistan needs to make clear to India that any large scale conventional attack across the border will automatically invite a strategic nuclear response. We need to convince India that Kargil was the last conventional war between the two countries. Any future war will be nuclear and therefore India needs to get out of its thick head that it can win a nuclear war. All it requires are nuclear detonations near the major rivers and dams and india is finished as well. In a major nuclear conflict all indian economic and industrial centres and nuclear sites will also be targetted. If india thinks Pakistan will be wiped out, India as it is today will also cease to exist. We do however need to rein in the jihadi outfits and recognise the fact that ' the death of a thousand cuts' will now no longer work. We had our chance, BB screwed it up by helping India resolve its Khalistan problem. For a full spectrum nuclear response capability, tactical nuclear weapons are needed. However, the application of nuclear weapons remains within the ambiance of "use of tactical nuclear weapons versus tactical use of nuclear weapons." China is about dozen Km inside their border and cutting off their access to about 750 Km of their territory. Lets see How would Endia handle this. They don't see us as a threat and ready to neutralize China in the region. Am i gonna see a massive retaliation from Endia to China any time soon ??? india is going to "massively" retaliate like they are "massively" retaliating now against China!!! Pakistan shoudlnt worry about india. It should prepare for America and Israel. If we do that we will manage India just fine. Any of you with members in the armed forces know if officers are trained in asymetric warfare? Almost 80% of indian nukes are delivered by Aircraft (FreeFall) and the rest via missiles (Agni style - Liqiud hydrogen fueled!). Pakistan has over 90% of its nukes delivered by Missiles (Solid Fuels). Nukes delivered by missles hit the target in minutes (3 to 7 distance dependant). Nuked delivered by Aircraft hit the target in 30 to 90 minutes depending on Distance with hidh risk of interception. Indian missiles require a refueling time of 2 to 4 hours with cyrogenic hydrogen with a IR signature making them susceptiple to airstrike. Pakistan strategy might be to takes out the Indian airfields with tactical nukes nullifying 80% of the Indian nukes leaving 10 to 12 nukes left. PAF with Look down capability would hunt the remaining agni sites and destroy the rest. The rest of the story of bhindia - history repeats itself. I dont know if it will really be this simple. Though the crucial factor is that most indian missiles are liquid fuel thus as you said requiring time to fuel which will allow detection of possible nuke launch allowing Pakistan to prepare its own force if such launch is than detected. One of the most scariest posts I have read in a long time. Scary but true and scary for india. Sfhussain rarely posts and when he does, he's rarely wrong. It's scary to me for other reasons. This information may lead someone to believe that we could get away with nuclear attack without getting hit back. It take the A out of MAD, which makes it more likely someone could actually try it think they could get away with it. I am sure someone in charge of the weapons would also have such information. I am not saying that it is incorrect, I just find that it somehow makes it seem that we could get away without getting hit badly. This is what I always thought how a nuclear war would get started. Someone somewhere with the power to act thinks he could get away with it. MAD keeps it sane. You know it is the absolute last thing to do, but somehow when someone sees this, they could think otherwise. That is very scary to me. I think one crucial element was missed in that (sfhussain's) analysis. What about nuke attacks from the sea? after all they are now claiming that they have completed tirade of delivery systems. So as you put it just imagine some in power makes that critical mistake. It is indeed very scary. Edited by 1Pakistani, 04 May 2013 - 11:06 AM. Well my analysis was going to be flawed given my limited understanding of the subject. However, it is not the analysis of this information that makes me worried, rather it is the impression one gets from it. A detailed unbiased report could also lead people to believe that MAD isn't ensured and they have a critical advantage which if they are able to exploit could lead to victory. The nuclear button controls a weapon that would not only blow a hole in your enemies head but also your own. Does it really matter if enemy loses 90% of his head and you loose just 40%? You'd both be dead. I think what scared me was that for a moment I was under the impression that we could win a nuclear war. Somehow, statistics presented in a certain way could make you forget that you too are getting your head blown, or that loosing 40% isn't that bad. If we are going to press that button we better do it knowing that 40% missing head is as dead as 90%. So it better be worth dying for. was referring to sfhussain's analysis and not yours. Agree with yours that it is quite scary. "What about nuke attacks from the sea? after all they are now claiming that they have completed tirade of delivery systems." There are Indian Claims but no tests or validation. Indian Missiles have not been adapted for under sea launch or from surface. The handling of liquid hydrogen in submarines can be difficult. Yes - all wars are inhuman and scary. If you are scared - Then remember "be only afrid of Allah". Lastly dont get believe westrn BS about certain anecdotes. Any war is winnable. I.E. Israel verus Hebzbollah in Lebnan. The reason the scenario got scary (for some) is that a "Stupid Indian" made the statement when tactical nukes are used by Pakistan on Invading indian formations. The statement provides for a logical action for Pakistan to not wait for an Indian 90 bombs to land on Pakistani soil. From my understnding Agni series is solid fuel as opposed to liquid fuel thus there is no issues with handling. However, they have been tested K-5 missile from submerged platform hence one question remains how easily can it be fitted into their submarines? But the point is there is no timing as to when the war will happen hence the fact that they have or will have sea borne delivery system should not be discounted in any assessment. We should not discount at all - Ihave not seen any tests - Hence not cedible threat. I am sure PN Navy would be doing thier job. So out off 10-12 nukes half are in a sub. It does not compare with over 100 - 150 nukes hitting Bhindia. If you expect us to suffer no damage then that wish will not be realistic. Pakistan will survive but bhindia will be dust. We can have discussions on radiation, winds, long term radi0activity, environment, etc - That discussion would be more fruitful at forums dedicated to environment, peace and love of "incredible india". PN has the ability to carry out similar attacks from the Arabian sea, i believe NASR can be integrated on Subs and on the missile boats that PN tested last year. Shyam Saran is not saying something new. It was announced by India in 2003. The Cabinet Committee on Security (CCS) met today to review the progress in operationaizing of India's nuclear doctrine. The Committee decided that the following information, regarding the nuclear doctrine and operational arrangements governing India's nuclear assets, should be shared with the public. Nuclear retaliation to a first strike will be massive and designed to inflict unacceptable damage. Nuclear retaliatory attacks can only be authorised by the civilian political leadership through the Nuclear Command Authority. A continuance of strict controls on export of nuclear and missile related materials and technologies, participation in the Fissile Material Cutoff Treaty negotiations, and continued observance of the moratorium on nuclear tests. Continued commitment to the goal of a nuclear weapon free world, through global, verifiable and non-discriminatory nuclear disarmament. 3. The Nuclear Command Authority comprises a Political Council and an Executive Council. The Political Council is chaired by the Prime Minister. It is the sole body which can authorize the use of nuclear weapons. 4 The Executive Council is chaired by the National Security Advisor. It provides inputs for decision making by the Nuclear Command Authority and executes the directives given to it by the Political Council. 5. The CCS reviewed the existing command and control structures, the state of readiness, the targetting strategy for a retaliatory attack, and operating procedures for various stages of alert and launch. The Committee expressed satisfaction with the overall preparedness. The CCS approved the appointment of a Commander-in-Chief, Strategic Forces Command, to manage and administer all Strategic Forces. 6. The CCS also reviewed and approved the arrangements for alternate chains of command for retaliatory nuclear strikes in all eventualities. The recessed deterrence has almost been thrown out of the window due to deployment of armed and mated missiles in silos. Also when the Indian nuclear submarine goes operational, it will carry nuclear armed and mated missiles. These two aspects clearly mean that hair trigger alert system is being followed atleast with regard to these deployed and mated nuclear missiles. This is a major change that has come about in recent times. The land based nuclear missiles deployed in the silos and the nuclear missiles carried on the submarines are always mated and ready to fire. This takes the nuclear equation a notch higher. A dedicated number of nuclear armed and mated missiles, the number of which has not been highlighted anywhere, will be ready to respond immediately. The chances of accidents or a rogue firing by Indians are much higher now than ever before. Recessed deterrence meant that the missile and the nuclear weapon were not mated together and this would have provided time for both the beligerants to rethink their response and even to give enough time to talk to eachother - this would not be available now in case of these depoyed missiles. The question is not about PN's capabilities but rather neutralizing their main strike before it happened. That is what I disagreed with sfhussain for. The fact of the matter is we should bet on assumptions we can take out their main strike before it happens or that their main strike will only be 10% of what their actual weapon size is as we will be able to eliminate rest. As for PN's capabilities it has been floating around for quite sometimes now that Babur can be launched from PN ships thus giving Pakistan the capabilities to attack from sea as well but the question would remain can we fire it from Subs to give us the second strike capability. Though if nasr can be fired from ships it will give us the tactical strike capability to knock out their attempted blockade of Karachi or other ports.